BAJURA, Oct 4: Punga Thapa Bhote, 16, and Kamala Bogati, 17, used to talk over phone for hours. Every new conversation would draw them closer to each other. Both of these ninth graders tied the nuptial knot six months ago. Both of them got married without telling their families. The couple did not come in contact with their family members for a week. When the girl’s family somehow got the clue of the matter, instead of getting worried they were overjoyed. They decided to validate the marriage and arranged a function to celebrate it. Marriage rituals and party followed to make the two, husband and wife. Local social activists were aware of the development. They tried to convince the elders of both families that child marriage would spoil the future of the young girl and boy. However, nobody was ready to listen, Keshab Bohara, president of Child Right Forum, said. “Instead of taking their son and daughter in confidence and stopping the marriage, they warned us for not creating obstacles against their culture and tradition,” he said. In a bid to stop the marriage, several social organizations including the forum had reached out to the chief administration officer. Child right protection officer Sagar Shah and member of parliament Pemba Gurung were also aware of the issue. But the marriage went ahead. “Everyone knew that this was wrong, but nobody could do anything,” Bohara said. The community took the marriage as its pride. A section of the people who were suggesting that the marriage should have been stopped or postponed felt challenged. They were not invited to the ceremony. “The marriage ceremony took place for five days at a local school. And those who were against it were not invited,” Bohara narrated. The school premise was full of students and parents as the school was taking admissions. However, elated family members of the bride and groom requested the school to avail the school ground to perform the marriage ceremony. The school responded positively and made available its ground for the ceremony. This is just a representative case of child marriage in Bajura. Data collected from 12 VDCs of the district last year reveals that 70 percent of girls and boys were married before the legal age. What is interesting about these child marriages is that most of them are love marriages- online love that transformed into marriages. According to social organizations active in the region, access to mobile and internet is one of the reasons behind increasing number of love affairs between teenagers and subsequent child marriages. Elders, on the other hand, do not take it as a problem when children get excited about marriage. “In fact, many welcome it as a part of their tradition,” said Naule Saud, assistant accountant at Toli VDC. 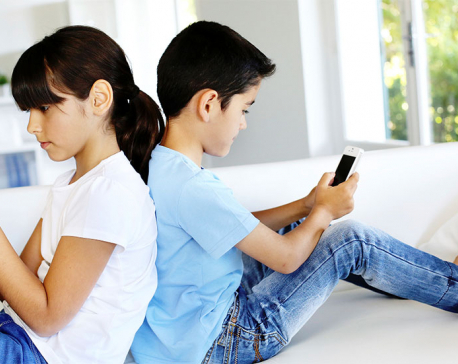 “What to say, mobile and internet is spoiling the future of many children,” he lamented. According to Saud, cases of child marriages have been growing in villages. They have grown common in Toli and surrounding VDCs of Gudukhati, Maankot, Pandusain and Budhiganda, among others. He claims that higher approval rate of child marriages in these VDCs is concerning as they have sizable number of educated community members. The communities that practice child marriages are aware of legal restrictions. Due to the fear of getting caught by police, they take time in registering the marriages. According to Basanta Thapa, accountant at Brahmatola VDC, very young mothers come to VDCs to register their marriage. “They do not come right after marriage. They come only after they have children,” he said. Child marriage is more common among Dalit and indigenous communities.